A pro ball player with a huge batting average--and an ego to match--is thrown back in time after being knocked unconscious by a pitch. 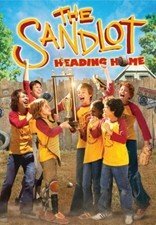 Waking up as a 12-year-old boy, he must lead his childhood team to victory against a wealthy land developer's club in an effort to save their sandlot from the bulldozers and maybe learn a lesson about teamwork and friendship along the way. Luke Perry, Danny Nucci, Keanu Pires, Sarah Deakins star. AKA: "The Sandlot 3." 96 min. Standard and Widescreen; Soundtracks: English Dolby Digital 5.1, Spanish Dolby Digital Surround; Subtitles: English, French, Spanish; featurettes; deleted scene; storyboards; bloopers; DVD-ROM content. Whimsical family comedy set in the summer of 1962 in which a nerdy boy decides to join the neighborhood kids in playing baseball at a decrepit lot. When the boy borrows his stepfather's prize baseball--signed by no less than Babe Ruth--and it lands in a yard inhabited by the mysterious "Beast," it must be retrieved at any cost. Tom Guiry, Karen Allen and James Earl Jones star. 101 min. Widescreen (Enhanced); Soundtracks: English Dolby Digital 5.1, Dolby Digital Surround, French Dolby Digital Surround; Subtitles: English, Spanish; featurette; TV spots; theatrical trailer. Two-disc set includes "The Sandlot" and "The Sandlot: Heading Home."